Horse with a shaggy coat. Horses that live in cold climates tend to grow wads of fuzzy hair to keep their bodies warm. Other horses that live in more temperate climates or even in mild climates also grow a shaggy coat during the colder months. If you body clip your horse during the cold months, you will need to make sure your horse is properly blanketed when it's cold and unblanketed, when the sun comes out and it gets warmer. These shaggy coats were great for wild horses as they wintered through the cold weather and are fine, in many cases, for domestic horses. However, domestic horses are often ridden during the winter months and these long, shaggy coats become a problem. When the horse is ridden or worked enough to work up a sweat, it takes hours for the coat to dry out. In the meantime, the horse is subject to chills, drafts, and illness. Fortunately, horses can receive a body clip that removes all or some of the hair, making drying far less inconvenient and time consuming, and also helping to keep the horse clean. Depending on your horse's work schedule, living conditions and your personal preference, several different styles of clips have been developed and you can choose the one that works best for you and your horse. Full Clip: With the full clip, the entire winter coat is removed. Many riders who compete in year-round events or work their horses hard throughout the year, choose this style clip. It is best used with horses that are stabled indoors and blanketed properly on cold days and every night. Blanket Clip: This clip removes the hair on the horse's head, neck, chest, shoulders, and lower portion of the abdomen and hindquarters. This clip is good for horses that work hard in the winter, but need protection from the cold on legs, back, and hips. Horse's with blanket clips must be blanketed on cold days and every night. Hunter Clip: The hunter clip is used with horses that work hard out in the field such as cross-country event horses, endurance horses, and foxhunters. This clip leaves a patch of hair on the back where the saddle goes and a path of hair on the legs. The remainder of the horse is completely clipped. These horse's need to be properly blanketed on cold days and every night. Trace Clip: The trace clip is good for horses that live mostly outdoors and do moderate work in the winter. With the trace clip, only the bottom third of the horse's coat is removed. With this clip, the horse sweats less during workouts and retains enough coat to stay warm outdoors in temperate weather. 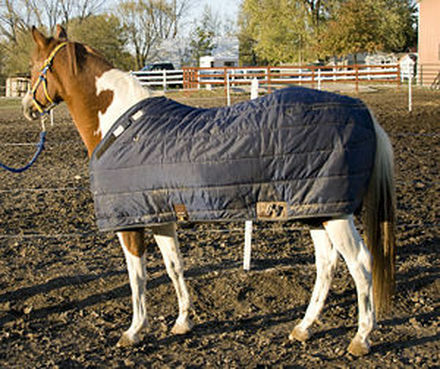 In cold climate, a horse will a trace clip must be blanketed on cold days and every night. Clippers that will work for your particular horse and give the style of clip you want your horse to have. Clipper Lubricant: Given the hair coat on many horses, you will need to stop periodically and lubricate your clippers to keep them from getting jammed or over-heated. White Chalk: For any clip other than a full body clip, you will use a piece of white chalk to outline the parts to be clipped before beginning. Grooming chalk may be purchased from a tack and feed store and works much better than regular chalk board chalk. Towels: Use a towel to wipe away oil and hair from the clipper periodically and also to wipe hair from the horse's body and yourself when necessary. Work Goggles: Goggles to protect your eyes from flying horse hair may be necessary, especially on windy days. Body clipping a horse is hard work for a pair of clippers. Don't try to body clip a horse with small StablePro style clippers. They are just too small to do a good job. Make sure to adjust the blade tension following the recommendations of the manufacturer. Use factory approved clipper oil frequently, and you may need to cool the blades with an aerosol cooler product. Thoroughly clean and lubricate the clipper after use and before storage for long life and prevent rust. Starting with a very clean horse saves blade life, but plan on sharpening your blades after two or three body clips. Have the clippers serviced and cleaned every couple of years. Wear work clothes, preferably wind-breaker type clothing that flying hair will not stick to and that you can strip off before heading back in the house or into your car. Give your horse a nosebag or hay net filled with hay to occupy it as you clip. Make sure the horse is clean before beginning to clip. A dirty coat will gum up the clippers and make clipping a hardship. Begin at the front of the horse and work toward the back, doing one side first and then moving to the other side. Hold the clipper so the blades lay flat against the horse and clip against the lay of the hair. Give your horse frequent breaks or consider doing the clipping over several days. Check to make sure the clippers do not become too hot. Clean up thoroughly right after doing the clipping. It doesn't take much wind to scatter the hair all over the place. If doing your clipping during the spring, you might collect a little hair and leave it where birds can find it to use in building their nests. An investment in high quality clippers will save you time and provide more comfort for your horse during the clipping process.